The conference kicked off with a session on long-term landscape evolution. 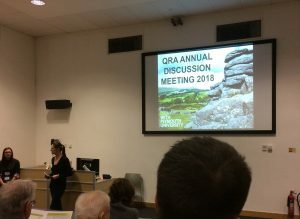 These talks featured more love for glaciers and gravel than this biologist is accustomed to, but the afternoon’s demonstration of landscape evolution modelling was very thought-provoking. It served as a helpful reminder that even the ground – never mind the vegetation – looked different in the past, something I’m trying to keep in mind as I model the LGM in southern Brazil. The second day focused on long-term ecology, human-environment interactions, and palaeoclimate reconstructions. Marie-José Gaillard’s keynote talk on the PAGES LandCover6k project showed the potential of the REVEALS landscape-scale model for vegetation reconstruction, and its value for European climate modelling. These themes were built upon by Ralph Fyfe, who examined past relationships between Exmoor’s people, plants and fire, and later by Michael Grant. His tracking of European Beech’s appearance in the UK felt particularly relevant to my research as he explored how to reconcile palaeoecological data and bioclimatic models. However, given the huge disparity in data density between these study sites and ours in South America, two of the morning’s other talks were especially exciting. First, Yiman Fang demonstrated novel (and, importantly, manageable!) ways to develop pollen productivity estimates for the floristically diverse region of southeast China. These are key for pollen-based vegetation reconstructions like REVEALS and the less data-intensive Multiple Scenario Approach, which Jane Bunting demonstrated in archaeological landscapes on the Scottish islands. Combining these techniques might allow us to more accurately estimate past land cover around the Jê archaeological sites on the southern Brazilian highlands – a very exciting possibility indeed! Thursday evening featured the conference dinner, hosted by the National Marine Aquarium. It’s surprisingly hard to eat a meal normally while sharks, rays and a turtle cruise through the UK’s largest aquarium tank beside you! The next morning, the meeting’s theme of data-model inter-comparisons was expertly summed up by Chris Clark’s keynote talk, with key points as relevant to our sites in the tropics as they are to his British ice sheet. Overall it was a very enjoyable and productive conference, and it was good to meet other students and researchers working in similar areas. (If I had any criticism at all it would be that some talks were hard to hear, but this is easily fixed by insisting speakers wear a microphone.) So, all in all, a great way to start 2018! Thanks and congratulations to the organisers for making it all happen so successfully, and I look forward to taking these lessons forward in the coming year. This entry was posted in Conference and tagged Oliver Wilson. Bookmark the permalink.